TEAMS representing two leading charities – Scotty’s Little Soldiers and School of Hard Knocks – have broken the world record for the longest rugby game. A total of 22 players competed for 28 hours and 20 minutes with the help of 12 referees and a team of 15 volunteers as the event raised £41,000. The event was supported by a host of recognisable names from the rugby world, including Scotty’s Little Soldiers ambassadors Louis Deacon and George Chuter. 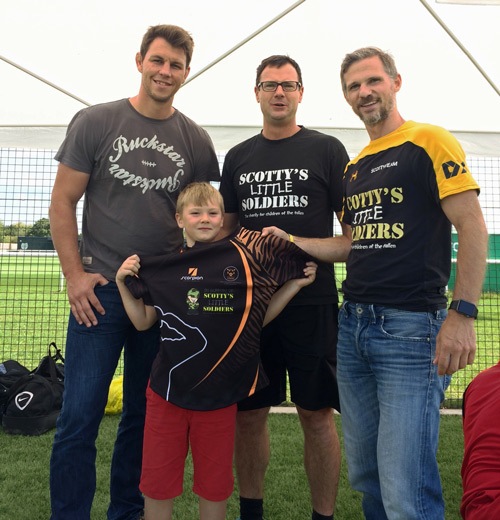 Stuart Robinson, CEO of Scotty’s Little Soldiers, commented: “We are thrilled to have been involved in world record rugby match challenge with the School of Hard Knocks. Scotty’s Little Soldiers is a national charity supporting children who have lost a parent in the British Armed Forces. It aims to provide relief from the effects of bereavement to young people who have suffered the loss of a parent killed whilst serving with the British Armed Forces. Inspired by the experience of Army widow Nikki Scott, the charity honours husband Corporal Lee Scott’s memory – both as a loyal soldier and a loving father – and provides a practical yet personal way for the public to show their appreciation for those brave individuals who make the ultimate sacrifice in the service of their country. Visit worldrecordrugbymatch.co.uk for more information.